This weekend we are attending some high level business meetings in true Book Box Club style… on a Disney sing-along infused road trip with plenty of biscuit supplies for the journey! Surely sugar is great for creativity, right? Now that all of your heavenly Fallen Angels April boxes are safely in the post (and currently being unboxed in houses all over the world) we thought it was high time to show you the contents of our March Under the Sea… themed box. As soon as we heard about the premise of our awesome featured read, we knew it would be right up our street and because both of us have a strange love for reading books involving watery worlds and coastal adventures, we couldn’t pass up this opportunity for an Under the Sea… theme! Brainstorming items for this box was so much fun; you really can’t complain when shopping for mermaidy gifts becomes part of your job! We have worked with so many talented people on this box and it has been really thrilling to see all of the items in progress. From getting late night messages from Kimcarlika about Swan sister hairstyles and seeing her beautiful illustrations come to life, to a hand delivery of stunning necklaces by our buddy Mariyam from Oh Panda Eyes; plotting and planning our March box has really been a team effort! 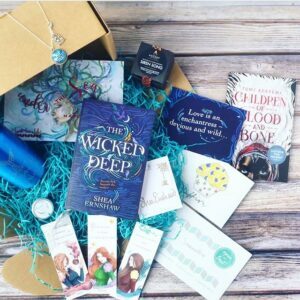 The Wicked Deep by Shea Ernshaw: They were accused of witchery and of seduction. They were sentenced to death by drowning. Now, every year, the Swan sisters haunt the sleepy coastal town of Sparrow, seeking revenge. They will inhabit the bodies of young girls. They will drag innocent boys into the depths of the sea. Can anyone break the curse and set Sparrow – and the sisters – free at last? Dive into our March read and find out! Clubhouse Invitation: Ahoy Book Box Club members! 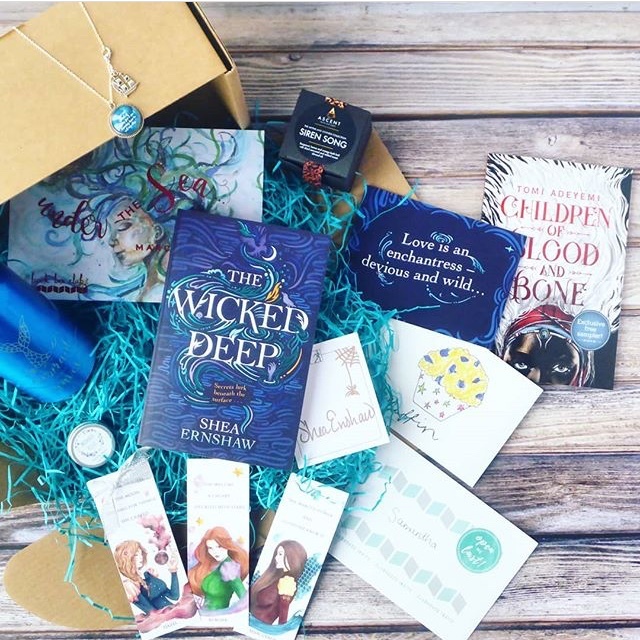 Come aboard our online Clubhouse and enjoy a friendly book group chat about The Wicked Deep. We will be joined by our special guest, Shea Ernshaw. I am Not Afraid of Storms pendant by Oh Panda Eyes: Adventures at sea require a hearty dose of courage! Channel your inner Louisa May Alcott with this pretty pendant, created exclusively for Book Box Club members by jewellery genius Oh Panda Eyes. 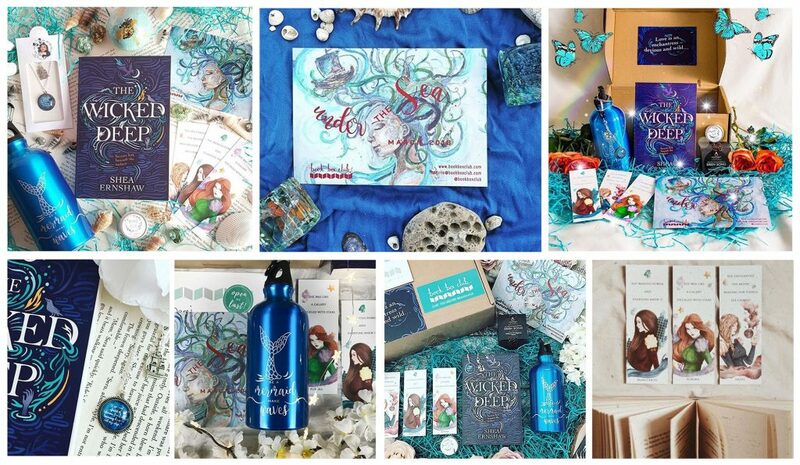 Mermaid water bottle by Book Box Club: Make like a mermaid… and keep hydrated, with a little help from our exclusive siren-inspired water bottle. Swan sisters bookmark set by Kimcarlika: Inspired by the vengeful spirits at the heart of our featured read, the awesomely arty Kimcarlika has designed this set of gorgeous bookmarks especially for Book Box Club members. Let Marguerite, Aurora & Hazel mark your page (just don’t let them tempt you into the sea!). Siren Song bath bomb by Ascent Bath and Body: Turn your bathtub into a tiny turquoise ocean (with splashes of gold for added drama)! This nourishing bath bomb will release marine scents of bergamot, lemon, orange and pink pepper and make you feel like a pampered mermaid, courtesy of bathing experts Ascent Bath and Body. Mermaid kisses lip balm by Bliss Botanicals UK: Pucker up! A mermaid kiss has great power. Slather your lips with this vegan vanilla bean balm from our shipmates Bliss Botanicals UK and prepare to bewitch your admirers, Marguerite style! Bookish goodies: A few little extras – check out these other brilliant, brand new YA reads, coming soon from our friends at Hot Key Books, Macmillan and Scholastic. Thank you to @ohpandaeyes, @sharonleavy1, @kamilareads, @donna_booksforlife, @demislibrary, @candlelightreads and@bethsbookshelf for these gorgeous photos. We have been tagged in so many gorgeous photos this month, just check out these snaps above from Instagram, and this is just a tiny sample! As always, we have been blown away by all of the positive comments, photos, blogs and videos. A massive shout out and a big THANK YOU to everyone who took the time to rave about our March box. Honestly, your encouragement means the world and seeing you enjoy unboxing our boxes fills us with joy! We can’t wait to chat with you all about The Wicked Deep next week in The Clubhouse.